In NYC, the Queensboro Bridge connects the island of Manhattan to the Queens borough. Over 1km long, the imposing metal structure of the Queensboro Bridge allows to span the East River and connects Manhattan to Queens. 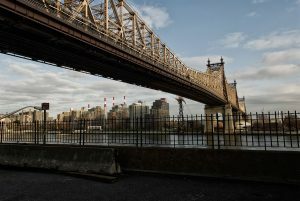 Longue de plus de 1km, l’imposante structure métallique du pont de Queensboro permet d’enjamber l’East River et de relier Manhattan au Queens.